DISCLAIMER: I made the bullet and gun, however I did pull the muzzle flash from the game. This weapon is intended to use said muzzle flash. This is the Plasma Launcher C-45rl. It is a slower firing energy weapon that fires off very fast-moving plasma charges. These charges do a fair amount of damage on their own, however they will cause a white colored explosion upon contact and will have adverse effects such as stunting health regeneration (if this is possible to add in PB2.5). This weapon is classified as a launcher, and is for slot five. It has indicators similar to the Sniper Rifle CS-YippeeKiYay, though they do not flash when the laser comes into contact with a body. They are solely there to alert the user that the firearm has been recharged. The plasma charger at the top of the firearm also can indicate when the firearm has recharged, though it is far less accurate. The plasma launcher reloads slightly slower than the Rocket Launcher CS-LitBro. It, like the current rocket launcher as well as the sniper rifle, must be held in order to reload. The user must "pump" the launcher similarly to how characters currently pump the rocket launcher or sniper rifle. This is subject to any change, of course. These are just guidelines for what I imagined this firearm does, but anything can be changed if accepted. I have the rest of the required files ready (as far as I understand). This includes the firearm without the plasma charger or indicator, a single frame of the indicator and charger (no animation frames), and also the original .xcf file. If required, I can make additional frames. Slow firing, energy based weapon. This energy rifle fires high damaging projectiles over long ranges with deadly accuracy. 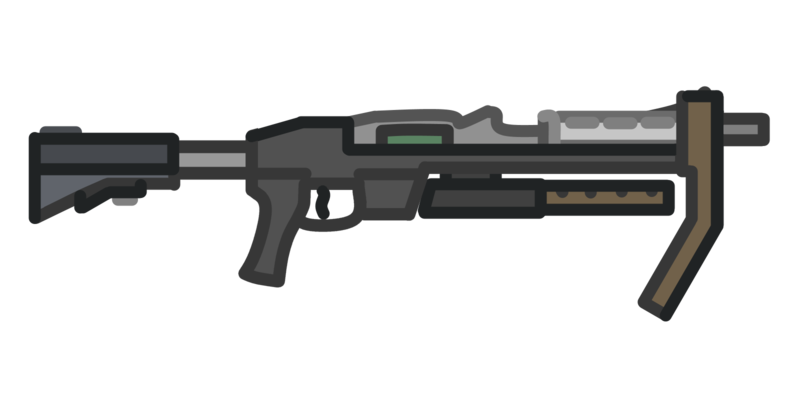 It's totally not a CS reskin of the alien rifle. This could either be a slot 2 weapon or a slot 4 weapon. If it were slot 4, it could have a similar firerate to the lite railgun, with the main difference being projectile model (and possibly damage?). The railgun's projectile can bounce while the energy rifle's projectile could pierce walls like a sniper bullet. Of course, the purpose of this weapon ultimately falls on Eric, as he has experience in balancing weapons. posting my stuff here in case replying on twitter isnt enough. also adding some details about the guns. assault rifle with similar stats to ray rifle tcorr, but with slightly slower fire rate and higher accuracy. has illuminated iron sights that glow in the dark. assault rifle that is inaccurate but has high fire rate. has a suppressor, so if mr jak nes's idea is added, it could share sounds with that (one new sound isnt that much, is it?). rocket launcher with explosion double the size of the cs litbro, but also has a doubled reload time. lights on scope flash when aiming at a target, like the sniper rifle. if it isnt possible to add a new projectile, remove the front section of the gun to something like this. branding on the gun could also be removed since it does not fit into the pb2 universe well. normal pistol with stats like marine pistol. long slide/barrel version has higher accuracy but fires faster. tactical version behaves like normal pistol, but does a bit more damage. tactical version could be edited to match more with the cs ghost. compact assault rifle with higher accuracy, more damage, higher wall penetration and slower speed than cs-rc. and thats it. good luck to everyone else in the polls. A simple carbine rifle outfitted with ballistic shield. Designed for CQB fighting or point-man duties. In game, a very high fire rate (significantly faster than C-01r) would be balanced by extreme recoil kicking in after 3-4 shots, and low damage per shot. Recoil recovery would be fast, allowing for repeated short bursts to be accurate, but extended firing to be wholly ineffective. The shield would act to reduce damage from incoming projectiles from 10 to 25%, and detonate AoE projectiles (the resulting explosion still causing damage and stability damage). A decor item to add to the barrels section. Would detonate on shooting. (Or could be set up to detonate on a timer?) Blown-up top and bottom versions included. The mythical green barrel is here. Would detonate on shooting. If possible, this item should blow up with a small explosion, but one that fires the top of the barrel off at very high velocity, making for an interesting physics item too. Blow up, damaged, and intact versions. Simple decor item, blocks gunshots until pushed over. Would be set as a vehicle like the crate so can be used to store a couple of guns, and can be pushed over or shot over. Fresh and damaged versions available. Simple decor item (barrel category). Small item that when shot causes a small acid/energy splash using components already in-game such as CS-BNG green energy blast effect. Does a little damage, destroyed version available. Another barrel or decor item. When destroyed, drops radioactive fuel rods that slowly damage nearby players. Destroyed version available too. All artwork created by and property of myself, and I give permission for it to be used or edited for use in Plazma Burst games. I have .PDN and .PNG files available, contact me onsite or via twitter @Doomzerker and I can send them over. Human counterpart to Android SLC-56 - with same hp, speed , ect. Leave your opinions on art submissions here: http://www.plazmaburst2.com/fanart.php.